Chemotherapy is available at Nicklin Way Veterinary Surgery. It allows us to provide a cure or to improve your friend’s quality of life for numerous types of cancers. We offer a wide variety of treatments, some of which are safely administered at home, while others require hospitalisation for a few hours. If your pet has been diagnosed with cancer, our experienced vets would be happy to discuss every option you have to maximise their quality of life. The diagnosis of cancer is stressful for pet owners, and the prospect of chemotherapy treatments can be equally difficult. However, the fear that the pet will become sick from chemotherapy treatments is unwarranted. Knowing how anti-cancer chemotherapy drugs work and what to expect from the treatments can help with making the decision that chemotherapy is right for your pet. When do we use chemotherapy to treat animals with cancer? Chemotherapy may be used as the sole treatment for certain cancers or may be used in combination with other treatments, such as surgery or radiation therapy. In some cases, chemotherapy may be used to shrink large tumors prior to surgery, or to help eradicate certain types of microscopic cancer cells that cannot be completely removed surgically. For cancers that have a high risk spreading, chemotherapy can be used after surgery to help prevent the appearance of cancer in other parts of the body. Chemotherapy drugs usually attacks cells in the process of cell division. Individual drugs may work through many different mechanisms, such as damaging a cell’s genetic material (DNA) or preventing the cells dividing. However, all rapidly dividing cells’ (including normal ones) are potentially affected by chemotherapy. Toxicity to normal, rapidly growing tissues in the body is the reason for most of the side effects seen with chemotherapy. Fortunately, these tissues continue to grow and repair themselves, after the chemotherapy drugs have been excreted. What are the typical side effects of chemotherapy? Compared to people receiving chemotherapy, pets experience fewer and less severe side effects because lower doses are generally used. The normal tissues that are most sensitive to chemotherapy are the digestive tract, the bone marrow (which makes the new blood cells), and hair follicles. Toxic effects to the digestive tract are responsible for decreased appetite, vomiting and diarrhea. In most cases, these signs are mild and usually resolve on their own, however, should your pet experience any side effects please advise your veterinarian for advice. 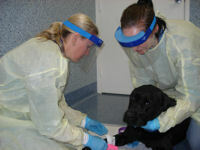 Although infrequent, some animals may develop severe vomiting or diarrhea requiring hospitalization and fluid therapy. The digestive tract side effects from chemotherapy may occur 2-5 days after the drugs have been administered. Suppression of the bone marrow by chemotherapeutic drugs may cause a drop in white blood cell count, leading to increased susceptibility to infection. Severe infections may require hospitilisation for intensive supportive care, including intravenous fluids and antibiotics. When a chemotherapeutic drug that is known to have potential for bone marrow suppression is used, a complete blood count (CBC) is checked before the treatment is given. If the white blood cell count is too low treatment may be postponed and antibiotics may be prescribed as a preventative measure. Subsequent doses of chemotherapy may be lowered. Hair follicle cells in dogs that are wire-haired or non-shedding may be particularly susceptible to chemotherapy. Certain breeds of dogs, such as terriers and poodles will experience variable amounts of hair loss. Cats may lose their whiskers and areas clipped on pets may not regrow until the chemotherapy is completed. There are many different types of chemotherapy agents and each has a different likelihood of causing side effects. 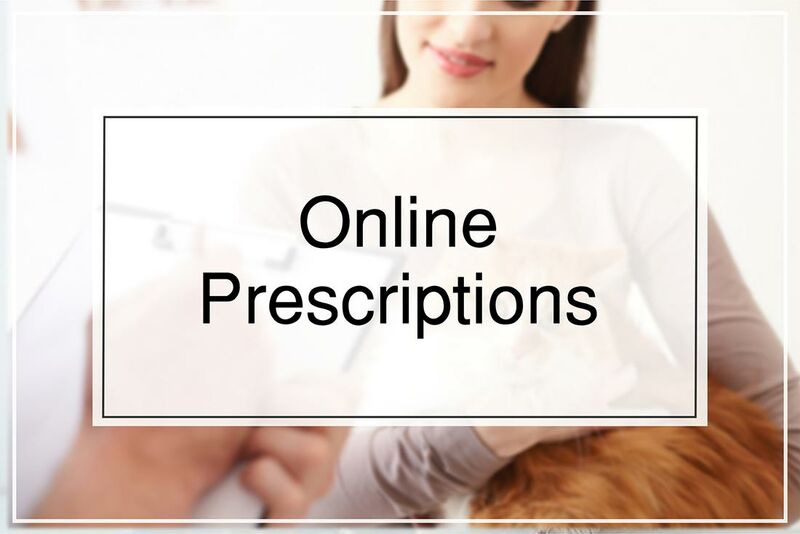 If your pet is treated with drugs known to cause certain side effects, we will prescribe medications to help prevent these complications, such as anti-nausea medications. In addition, we will give you instructions on what to do if and when a problem arises. We seldom see severe side effects; it is estimated to be less than 5% of all pets receiving chemotherapy. With proper management most animals have an event free chemotherapy. Please advise us if you have any concerns. How a chemotherapeutic drug is administered, how often it is given and how many treatments are given varies from cases to case. Some drugs are oral medications that you give at home. Others are injections that require an outpatient appointment. In some instances, slow infusions or repeated treatments throughout the day may require the animal to spend the day in hospital. The treatments are typically repeated weekly to every third week. Blood tests may be needed to monitor the effects of chemotherapy during the weeks between drug treatments. The duration of chemotherapy depends on the type of cancer and the extent of disease. Some animals need to receive chemotherapy for the rest of their lives. Usually, however, treatments are discontinued after a period of weeks to months provided that the cancer is in remission, i.e that there is no detectable evidence of cancer in the body. Chemotherapy may sometimes be resumed if the cancer recurs. Chemotherapy drugs given to pets have the potential to cause damage to cells in humans. Exposure to owners and their family to chemotherapy drugs or your pet’s urine or faeces can theoretically pose a risk. This risk is probably greatest for those people who are pregnant or breast feeding, or for people who are on immunosuppressed medication. If you are administering chemotherapy tablets at home, it is suggested that you wear the gloves supplied to you when handling the tablets, and that the tablets are not crushed or broken nor capsules opened (please read thoroughly the information sheet we provide you with any tablets to be given at home). Certain chemotherapy drugs and their by-products may be excreted in the faeces or urine for up to 48 hours following administration. The risk associated with exposure is slight, however, should your pet have an accident in the house, it is wise to wear gloves, blot the area with flushable paper and clean the area with a dilute bleach solution. There is no associated risk with routine contact with your pet such as petting, playing or handling of food and water bowls. It is important that medications be strictly kept out of the reach of children. Should accidental ingestion of chemotherapeutic drugs occur, contact a poison information centre immediately. Should any unused chemotherapy drugs remain after treatment, please return them to Nicklin Way Veterinary Surgery so we are able to safely dispose of them. What can be expected from chemotherapy? As much as we do strive to cure cancer, this is sometimes not possible. Our goal is therefore to improve your pet’s quality of life. To this end, chemotherapy can be used to minimize the discomfort caused by a tumour, or to slow down or arrest the progression of the disease. We encourage you to discuss your concerns with your veterinarian when making this decision.